Graffiti is everywhere; Los Angeles alone scrubs away over 30 million square feet of graffiti a year. But, not all graffiti is created equally. While much of graffiti is still the standard gang symbol scrawled on a wall, recent times have seen a rise in what is considered “street art.” This brings a fundamental tension to the foreground—the rights of a building owner versus the rights of the artist. 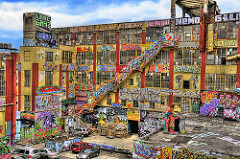 What a building owner considers vandalism could actually be considered a work of art by the “artist” and society at large. The recognition of graffiti as art brings with it special rights that artists have to protect the integrity of their work and prevent its destruction under the Visual Artists Rights Act of 1990 (“VARA”). VARA amends existing federal copyright law and adds protections for the “moral rights” of artists to attribution and integrity. More importantly, VARA explicitly contemplates the rights of artists with respect to works of art on and incorporated into buildings. Artists whose works fall under VARA’s protections can turn to the courts to prevent the intentional or grossly negligent destruction of their works if they are of “recognized stature” or to prevent the intentional destruction, mutilation or modification of those works if doing so would be “prejudicial to [the artist’s] honor or reputation.” 17 U.S.C. §106A (a)(3). VARA provides no guidance as to what “recognized stature” entails and judicial interpretations vary greatly. If an artist’s work is destroyed or mutilated in violation of VARA he or she can seek monetary damages. As a real estate developer in New York recently found out, certain facts in conjunction with VARA’s protections can lead to substantial losses for building owners. When the artists discovered the developer’s imminent plan to demolish the building, they brought suit seeking injunctive relief under VARA. The court denied preliminary injunctive relief, stating that a written opinion would be issued soon. The court also warned the developer that while he was free to demolish the warehouse, he was potentially exposed to significant liability if it was ultimately determined that the artists’ works were of “recognized stature” under VARA. The court issued an opinion eight days later, but in the interim the developer whitewashed most of the works, irreparably destroying them. The court ultimately decided that 45 of the 49 works were of “recognized stature.” In doing so the court relied on expert testimony and public recognition of the site, acknowledging that this public recognition was largely encouraged by the developer when he appointed the curator and allowed the art to take place. The court, relying on expert testimony, also found that all of the 49 works could have been removed. Several works could have been easily removed by the artists themselves because the works were on materials such as sheetrock and plywood, and the remaining works could have been removed by using modern conservation techniques. The court noted that, per VARA, the developer could have been exempted from liability if he had given the artists 90 days’ notice to allow the artists to remove or pay for the removal of their works. The court found that the developer’s hasty destruction of the works, in conjunction with his intentional refusal to provide the artists with notice and opportunity to remove their work, and his subsequent lack of remorse in his ensuing testimony was evidence of his intention to “willfully violate” the artists’ VARA rights. Based on this determination, the court awarded maximum statutory damages for each of the 45 works destroyed for a total award of $6,750,000. Ultimately, the take-away is that where property rights and artist’s rights intersect, VARA can result in unexpected, and costly, consequences for building owners.